Throughout the year, there are customers and clients who make an impact on your business, whether it be through repeat business, bulk purchases or simply through good relationships. Christmas is a time to show appreciation and goodwill. You should take the time to thank those who have supported your business. 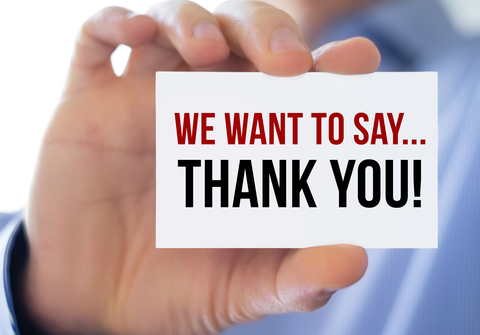 But how do you say thank you authentically while leaving a lasting impression? Business gifts featuring your brand name and logo are an easy and affordable way to thank your customers and clients and also reinforce your brand. Items like bags, pens, mouse pads, desk calendars and screen cleaning cloths are useful gifts that say thank you without being too grandiose. The benefit of useful, office-based gifts is they remind your client or customer of your brand, not just during the Christmas period, but throughout the year. Gifts like these are easy and affordable to buy in bulk and thus are a wonderful way to thank a large volume of customers or clients. For example, if you have worked with multiple teams from one organisation throughout the year, you can thank all of them and not be forced to choose a select few of the main players. This shows the company you value the input of all people involved, not just the project leaders. Treat your loyal clients and customers to a special event. Choose your favourite venue, pick a theme and find an event organiser who can assist you to make the event unique and special. Hosting an event allows you to spend time in an informal setting with your valued customers or clients and show them how you value their connection to your business. Events also provide a wonderful opportunity for networking with new potential customers or clients. Hosting an event is a great way to position your brand as generous and fun, or depending on how you run the event, can position your business as inspirational, innovative or as a thought-leader. Events are a great way to get everyone out of the office in a fun and social environment, creating positive feelings about your brand. A personalised gesture or gift is a great way to ensure your customer or client feels appreciated. This can be as simple as sending a handwritten note or Christmas card, or as elaborate as having a gift monogrammed with the individual’s initials. Think about what your recipient would enjoy and what they would really benefit from. For example, if a client mentioned during a project they have a particular interest or desire to learn a new skill, see if you can find a relevant course. Personalising your gift is an easy way to say, ‘I value our relationship” and makes the recipient feel important. Thanking your valued clients or customers at Christmas does not have to be an expensive or challenging undertaking. By leveraging these three ideas, you can easily show appreciation, enhancing your relationship with the recipient for potentially years to come. business cards, stationery, brochures, catalogues, posters, banners and signage for businesses across Australia. Kwik Kopy Australia was established in 1982 as a Master Licence holder from the Kwik Kopy Corporation U.S.A and has grown to operate over 90 franchises throughout Australia today.